The dream of friendly, sentient robots—Rosie from The Jetsons, doing all the housework—once seemed like a quaint relic of an older era. But, as we’ve seen with virtual reality, older technologies have a way of resurfacing. Artificial intelligences are being constructed with ever-increasing sophistication, and robots are being built that can run and leap and lift and scramble over ice like superpowered dog men. Parents everywhere have already realized the delightful ways an iPad can occupy a child’s mind for hours on end. The notion that we may someday have robots to care for us, and in turn receive our affection, seems increasingly likely. This little girl is ready for the moment to come. 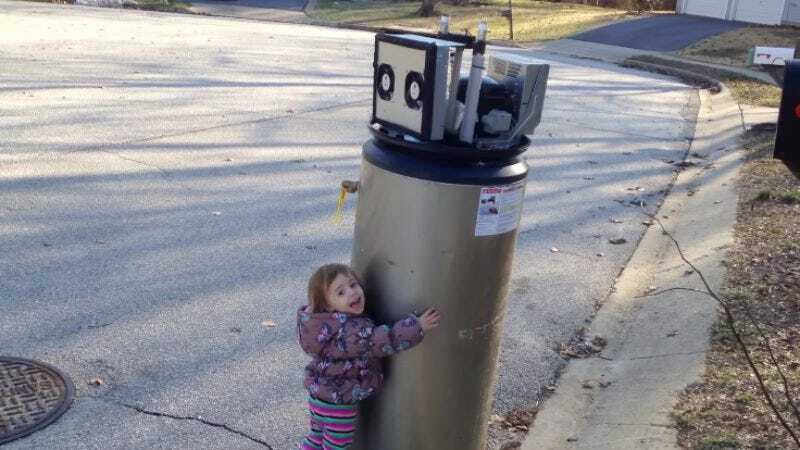 What she is hugging here is not a robot, despite its shiny titanium body and eye-lock sockets on top—it’s a water heater. And yet she repeatedly says, “Hi, Robot!” to it, then walks up and gives it a hug. She pats the robot because she loves it. “I love you,” she tells the robot as the short vision of our mechanically enhanced future draws to a close. “I love you.” The robot is unyielding, receiving her affection without so much as a blink.